Flying with Kids: The first or final frontier? Take a pair of adults eager to explore new cultures, a teenager who prefers surfing and shopping to museums, and a restless seven year old. Planning a family vacation, to please everyone, can be a trying experience. Not in Morocco. This North African country offers something for everyone. Travel camel back across rolling sand dunes. Ride mules in centuries-old Berber villages. Surf and ski at modern resorts. Visit imperial cities, complete with palaces, mosques and open-air markets. A family holiday in Morocco combines adventure, culture and just plain fun. Generations of moviegoers have followed the footsteps of Lawrence of Arabia and Alexander the Great through Morocco's southern deserts and will recognize the ancient fortress of Aït ben Haddou from films such as Gladiator and Kingdom of Heaven. Yet many visitors are surprised by the authenticity of these exotic film locations and that their experience, through film, is limited to only a few of the country's many attractions. In just one week, you can bathe in the Mediterranean, visit the Roman ruins of Volubilis and spend a day in the Middle Ages, just by wandering through the winding alleys of Fès, one of the largest living medieval cities in the world. And still have time to drive some nine hours south, traversing the Atlas Mountains along the way, to the Sahara Desert. Riding a camel to the top of the sand dunes of Merzouga, to watch the sunrise or set, is an unforgettable experience. But not the only one. Follow the "valley of one thousand kasbahs" and discover sand castles that rise up along this ancient caravan route. Marrakech, with its snake charmers, storytellers and bustling market, is another must. And if you have the time and energy, visit Essaouira with its windswept ramparts that overlook the Atlantic. It's a favorite among surfers. But you can also ride horses and camels along the beach, savor fresh fish and stroll through this historic town, which the rock star Jimmy Hendrix once wanted to buy. Only 13 kilometers of water separate Morocco from Spain. Yet the one-hour ferry ride across the Strait of Gibraltar transports you into an entirely different place and time. Good roads and railways, twelve airports and friendly Moroccans make travel easy. And between one destination and another, there is a whole world for each family member to discover. That is the magic of Morocco. Morocco is an old world melting pot with a unique North African history. Like its neighbors to the east, Morocco was a Phoenician and Roman trade center, an outpost for Vandals, Visigoths and Greeks, an Arab colony, occupied by Spain and Portugal, and even a French protectorate. Yet unlike Algeria, Libya and Tunisia, with whom Morocco shares the name Maghreb, foreign dominance rarely extended beyond the periphery. For centuries local tribes, known as Berbers, retained their independence and from time to time even ruled. Online maps are a great travel planning resource and a great way to get the kids involved in a family vacation. Map the imperial cities - Marrakesh, Fez, Meknes and Rabat - as well as Berber villages, desert oasis and mountain ranges. Use online maps to pinpoint your family travel destination and get a lay of the land. Books are a great way to introduce young children to a new adventure and get teens and tweens ready for a family trip. We've compiled a list of books about Morocco and books by Moroccan authors for children of various ages and with varying interests. What better why to begin a journey that a trip through literature? Moroccan music is a web of rhythm and sound. And it comes in a variety of forms. Arab-Andalusian music, a classical tradition imported from Muslim Spain, combines rhythm, vocals and instrumentals in complicated musical structure called nawbat or harmonic modes. Berber music, played at weddings, festivals and tribal gatherings, are poems and tales told through song. Moroccan popular music is rooted in Arabic style but influenced by African, Western and all forms of Moroccan music. Read Moroccan newspapers online and, in addition to brushing up on Moroccan current events, find out what's happening from Casablanca to Tamegroute and discover what Moroccans are reading about. Online resources make learning lots of fun. Learn about Ibn Battuta, an explorer from Tangier, and take a virtual tour with this 14th century traveler. Map the routes followed by Ibn Battuta and Marco Polo and compare the two. 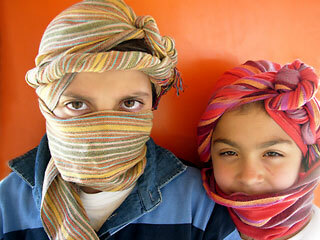 View images of daily life and discover the Moroccan culture. Get fun facts about Morocco. Test your knowledge before you depart and again when you return. Print the information you find fascinating and take it with you on your family trip. Explain your findings to your family members and use the things you learn to make your travel journal really cool. Associations and non-profit organizations are a valuable resource as well as means to get involved. Find out more about a few of the organizations working to preserve the Amazigh Berber culture as well as those working to conserve Morocco's national treasures.